Powerful and elusive, the muskellunge — referred to by many as “the fish of 10,000 casts” — has provided both a challenging yet gratifying fishing experience for anglers across the country. Since the fall of 1994, Chae Dolsen has had the pleasure of fishing these incomparable beasts. 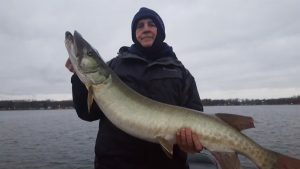 And since 2000, Dolsen’s Webster Lake Guide Service has been conducting indelible musky fishing day charters for musky enthusiasts in the finest lakes of Kosciusko County, Indiana. Located in North Webster, Ind., roughly 40 miles West of Fort Wayne, Lake Webster, Lake Tippecanoe, James Lake and the Barbee Chain are home to arguably the best musky fishing in the state of Indiana. The revered Webster Lake boasts an average of six adult fish per acre, measuring around 38 inches on average, according to the Indiana Department of Natural Resources. James Lake holds the state musky record at 42-pounds, 8-ounces, while the Barbee Chain’s diverse features make it a perfect spot for massive muskies. These waters also feature many other fish species like bass, pike and crappie. A family-friendly, 100-percent catch-and-release musky fishing guide, Webster Lake Guide Service provides both day and night fishing packages, which include all rods, reels, bait, tackle, and boating equipment. Cabin rentals, outfitted with several amenities to accommodate up to five people, are also available for nightly and weekly stays. Dolsen and his team of Webster Lake fishing guides regularly fish these unrivaled Indiana waters, and they will utilize all of their knowledge to ensure a memorable fishing experience.